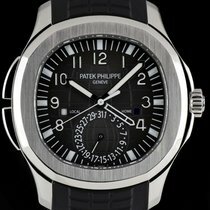 The Aquanaut is both a modern sports watch and a relatively affordable luxury watch from Genevan manufacturer Patek Philippe. Watch fans value it for its relation to the Nautilus, precise calibers, and high quality. 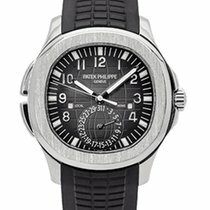 Patek Philippe first introduced the Aquanaut to the public in 1997. 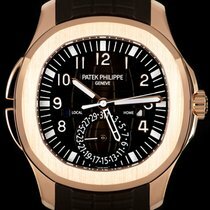 Its design is clearly inspired by that of Patek's iconic sports watch, the Nautilus, which had been designed some 20 years prior by famous watch designer Gérald Genta. An octagonal, porthole-shaped bezel characterizes the look of both timepieces. However, the bezel of the Aquanaut is much rounder than its older sister's. This is also true of its crown protector and lugs, which lend this watch its more curvy and modern appearance. The Aquanaut has more in common with the Nautilus than just aesthetics alone: It also shares some important technological features. Both are water resistant to 120 m (394 ft), equivalent to 12 bar. 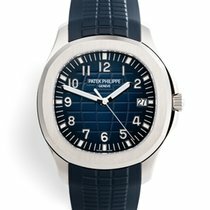 This is unusual for a watch from Patek Philippe, as most of their luxury watches are only water resistant to 30 m (3 bar, 98 ft). Furthermore, the same high-precision in-house caliber powers both collections. Both watches are also made of stainless steel. For many watch manufacturers, this metal is a standard case material. Patek Philippe, however, rarely uses stainless steel. The Aquanaut is also available in one of their preferred materials: gold. The Aquanaut usually comes on a rubber strap that is especially resistant to water, abrasion, and UV radiation. Those who prefer something a bit less sporty can also get this watch with a three-piece link stainless steel bracelet. How much does an Aquanaut cost? The basic version of the Aquanaut has the reference number 5167. Its affix, "extra large," is a bit misleading, as the 40-mm three-hand watch with a date display isn't unusually large. The automatic caliber 324 S C powers the Aquanaut Extra Large. It oscillates at 28,800 alternations per hour (A/h) and has a 40-hour power reserve. Plan to spend around 28,900 USD for a never-worn stainless steel version. Pre-owned watches are only slightly less expensive, at 26,600 USD. If you prefer the rose gold model with a chocolate-brown dial and strap, expect to pay around 34,700 USD. 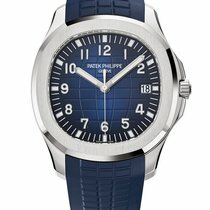 For the collection's 20th anniversary, Patek released the Aquanaut 5168G with a 42-mm white gold case , a blue dial, and a matching rubber strap. This timepiece costs between 47,400 and 51,200 USD. You can save quite a bit by choosing a slightly older, pre-owned model. 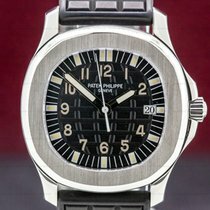 Prices for the 38-mm Aquanaut 5065A range from 19,100 to 23,100 USD. 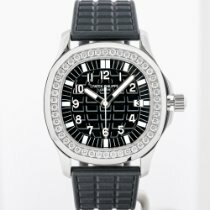 The Aquanaut Luce is the collection's women's model. These watches have smaller cases (35.6 mm) than the men's models and 46 diamonds on their bezels. The stainless steel version comes with a black, brown, blue, or white dial with a matching band and is equipped with a quartz movement. The rose gold edition features an automatic movement. Expect to pay around 13,900 USD for a stainless steel model and 34,700 USD for one in gold. The Aquanaut Luce Haute Joaillerie has a particularly feminine design. It is also made of rose gold; however, its mother-of-pearl dial has a chess-board pattern, its bezel is studded with 40 baguette-cut diamonds, and every hour index also has a shimmering diamond. You'll have to invest about 78,700 USD to call this treasure your own. The Aquanaut Travel Time is able to display a second time zone. An additional hour hand allows you to keep track of the time back home, a practical feature when traveling. You can use the two push-pieces on the left side of the case to set the local time an hour forward or backward. The minute and seconds hands do not change. The words "Home" and "Local" sit next to two smalls windows at 3 and 9 o'clock, respectively. These windows serve as day/night indicators. A subdial at 6 o'clock shows the date using a hand. The automatic caliber 324 S C FUS ticks away inside this timepiece. Like the standard caliber 324 S C, this caliber also has a 40-hour power reserve and a frequency of 28,800 A/h. Set aside around 39,300 USD for a stainless steel model. Prices for examples in rose gold cost up to 50,900 USD. The 2017 version of the Aquanaut Travel Time Advanced Research is especially exclusive, limited to a run of 500 pieces. Not only does it have a white gold case, but it is also equipped with state-of-the-art technology. Thanks to the new Spiromax balance spring, this timepiece only deviates +2/-1 seconds per day. What's more, a single stainless steel component has replaced the complicated push-piece mechanism previously needed for setting the local time. A cutout in the dial allows the wearer to view this new component at work. This limited edition watch costs around 168,000 USD. The Aquanaut Chronograph is the latest addition to the Aquanaut family. Its 42-mm stainless steel case contains the proven caliber CH 28-520 C, which provides this timepiece with a date display at 3 o'clock and a 60-minute counter at 6. This chronograph comes with both a black and an orange rubber strap, allowing the wearer to adapt it to his or her style. The list price for this timepiece sits at 39,380 euros, equal to around 45,600 USD. 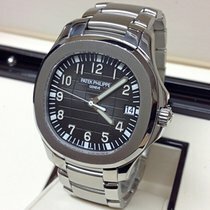 Patek Philippe was founded in 1851. Antoni Patek (1811-1877), a Polish exile, began working with the Frenchman Adrien Philippe (1815-1894) in Geneva in 1845. The year prior, Philippe had invented the crown for winding and setting a pocket watch. Before that, a key was required to power the movement. Patek and Philippe sold two watches to Queen Victoria in their first year at the Great Exhibition in London, an important sale for the fledgling business. European nobility quickly became regular customers. Tiffany & Co. ordered 130 watches to sell in the United States. Patek Philippe acquired many patents in the following years, such as a patent for the first double chronograph in 1902. In 1925, the company introduced the first wristwatch with a perpetual calendar. Jean and Charles Henri Stern produced dials exclusively for Patek Philippe. In 1932, the brothers bought the company. 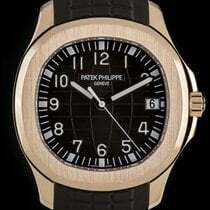 Since then, Patek has belonged to the Stern family, with Thierry Stern leading the company since 2009. 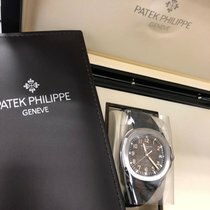 Every year, Patek Philippe produces around 50,000 watches. Aside from Rolex, it's one of the few independent luxury watch manufacturers left.